Some people may tell you that scraping texture from ceilings is easy. They may also have a bridge for sale. It’s probably best not to buy it, despite the fantastic price. This is what DIY texture removal and ceiling smoothing looks like. RemoveCeilingTexture was called in to fix the mess. In actuality, scraping texture from ceilings is messy and difficult work. Once the texture is gone, it still won’t be paint ready. Popcorn texture is applied so that builders don’t have to finish the ceilings properly. This saves them time and money. So once you’ve scraped your ceilings, you’ll see all the imperfections. This applies to both drywall and concrete ceilings. If your ceilings are concrete, you may have to deal with waves and ridges caused by the concrete forms. The ceiling will need to be professionally finished if you want it to look decent. You also have to consider the fact that houses and apartments built before 1980 could have asbestos in the ceiling texture. Asbestos was used in all sorts of building materials, including some ceiling textures, because it is fire resistant. At the time, they thought it was a miracle product. They later learned that microscopic, airborne asbestos fibres are extremely dangerous to breathe in. The fibres get lodged in your lungs and can cause scarring and mesothelioma, a type of cancer. You definitely don’t want to be scraping texture from ceilings if there’s a chance it could have asbestos fibres. At RemoveCeilingTexture.com, we test the texture to make sure there’s no asbestos if the building was built prior to 1985. This is for our safety as well as yours. The before photo is after the homeowner tried scraping texture from ceilings. In the end he ended up calling RemoveCeilingTexture.com to fix the mess. We were recently contacted by a homeowner in downtown Vancouver who had figured that scraping his ceiling texture would be a piece of cake. His condo was built in the late 1980s, so asbestos was not a concern. He started in the living room with a friend’s help. What would take one professional no time at all ended up taking them a combined time of over 20 hours, and that was for the living/dining room only! And even with all that work, the ceiling looked horrible once the texture was gone. On top of that, he had a major mess on his hands, as the scraped texture ended up covering every surface in the apartment. The floor was a complete mess after the homeowner tried scraping texture from ceilings. RemoveCeilingTexture.com’s process is not nearly this messy. The homeowner soon realized that he was in over his head, quite literally. When you don’t have the tools and most importantly, the expertise, the project quickly turns into a nightmare. He decided there was no way he could ask his friend to continue this madness with him, if he valued his friendship. So he contacted us. We fixed the living and dining room ceilings that they had worked on and resurfaced the ceilings in the rest of the condo. We also repaired a section of ceiling where a wall had been removed. The ceiling transition between the two rooms is now seamless. Wall removal left a large section of the ceiling to be repaired. We fixed this with no problem. After deciding that scraping texture from ceilings himself was too difficult, the homeowner called us in to do the rest of the condo. At RemoveCeilingTexture.com, our area of focus is quite specific: We take ceilings from lumpy and dated to smooth and modern. We have the tools and the expertise and so we were able to rescue his DIY attempt, save his sanity and quite possibly save a friendship. World peace is next on our list. The laundry room gets updated thanks to popcorn ceiling texture removal. The truth is, scraping texture from ceilings is only the first step in the process of getting smooth ceilings. Once the texture has been removed, we apply layers of compound, by hawk and trowel, to ensure the finished ceiling is level and free of any blemishes. This takes an expert eye and years of experience. Since your ceilings will need to be professionally finished even if you scrape them yourself, why not save yourself the headache and mess and have a professional work on them from the start? 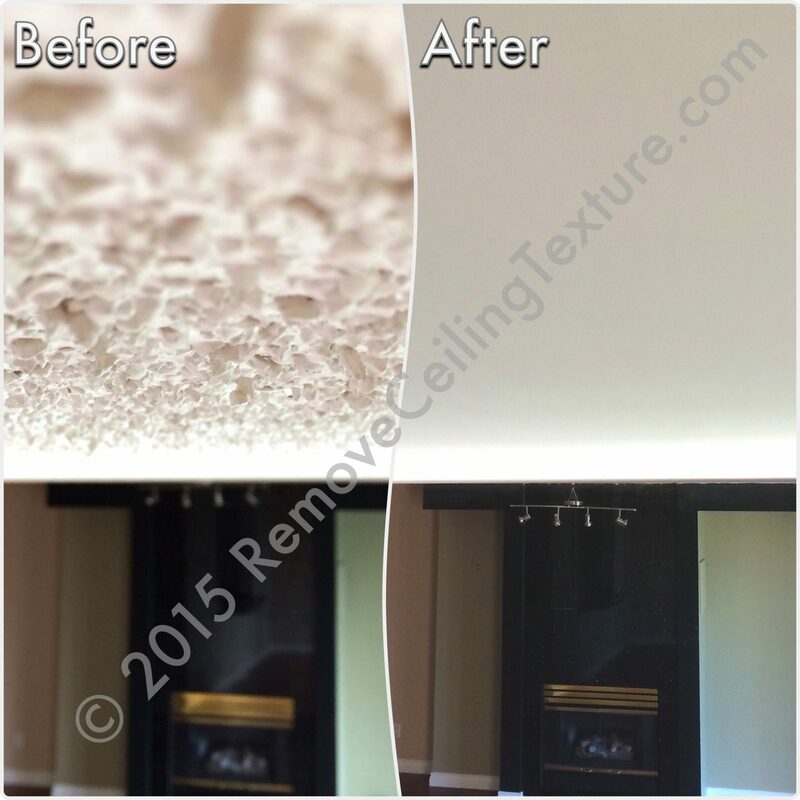 Call us today at 604-420-7578 for a FREE QUOTE on ceiling texture removal, or contact us by email. Did you try to scrape your ceilings yourself and now need them fixed? Contact us today for a FREE quote!